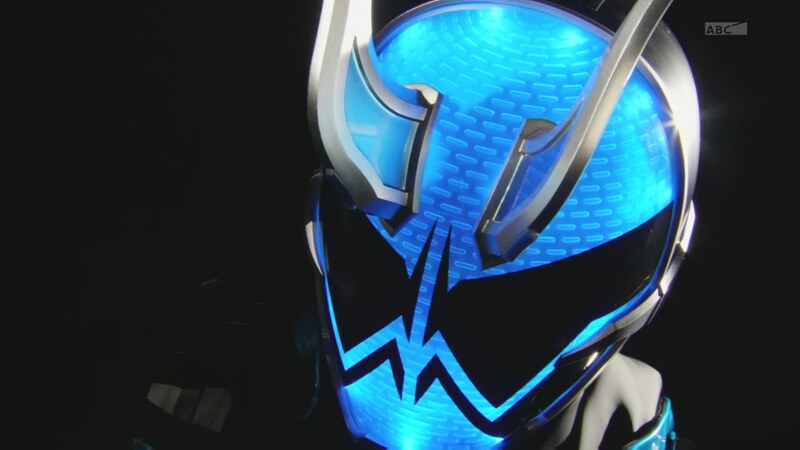 Recap: Kamen Rider Ghost, Episode 4 – Amazing! The Castle in the Sky! 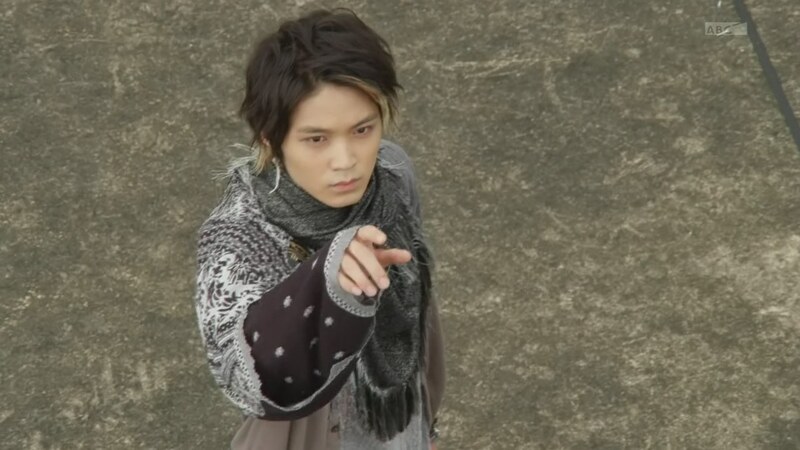 After watching Takeru gain the Robin Hood Eyecon, the Mysterious Man tells Aran that he can do things his way this time if he likes. Back at the lab, Onari and Akari argue over a possible case. Takeru is not as anxious since things have gone pretty smoothly so far. Grampa Sennin pops in and says things won’t always be as easy. He gives a clue and Takeru figures the next luminary is Sengoku general Oda Nobunaga who tried to unite all of Japan by using new ideas on the battlefield. Onari gets a call and they head upstairs to meet with Kuroda Hideo from Sengoku Corporation. He’s here to ask for their help. His president, Hashiba, has been acting off lately even though he’s always been a kind man. Strange things like floating office supplies have started happening around the same time Hashiba started acting weird as well. Akari thinks floating things are absurd. But Onari reminds her she floated all over the place last week. Takeru goes with Kuroda to the office to speak with Hashiba who has just angered a business partner by wanting to take over that company. Suddenly, stuff around the office begins floating in the air while the other company’s president gets dragged along… by a Ganma! Takeru sees the Ganma and follows them to the roof. The ganma hurls the president off the side and Takeru quickly henshins and jumps to catch him. After safely (but painfully) landing on the ground, Takeru faces off against the Ganma. None of the people can see then fighting, except for the explosions. The Ganma splits himself in two. Yurusen flies in and tells Takeru to split the Gan Gun Saber in two and stick them together to form a naginata. 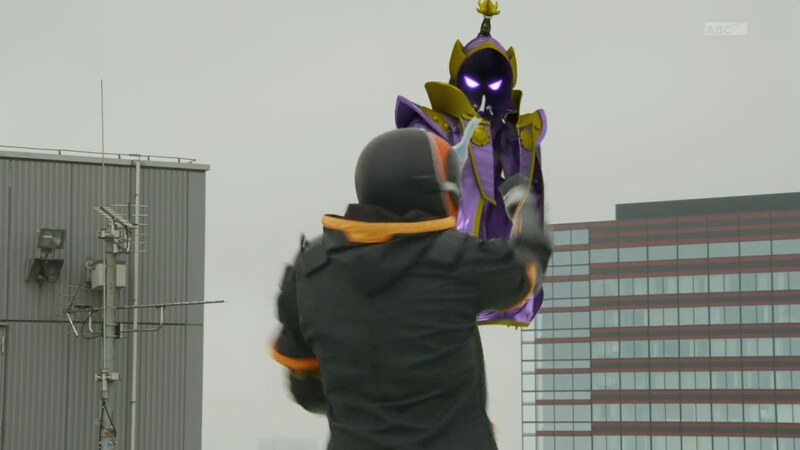 Takeru uses it against the Ganma, but he destroys the fake clone instead of the original. The Ganma runs off. But Takeru is at least sure an Eyecon is nearby. Meanwhile, that black and blue person recording Takeru earlier is back again. Another Rider? Takeru heads back to the office where he sees a woman driving away the president with a smile. Ghost Takeru sneaks into Hashiba’s office only to be quickly seen by him. Takeru introduces himself and Hashiba recognizes the name as the head priest of the Daitenkuu temple visited his home once. Takeru says that must have been his father. Hashiba says the chief priest visited to see the framed letter written by Oda Nobunaga himself. Hashiba’s family were retainers of the Oda clan for generations and he says Nobunaga is his idol. The woman from earlier asks to speak with Hashiba. Takeru excuses himself and meets with Kuroda who explains the woman is Sakuma Risa, the president’s secretary. 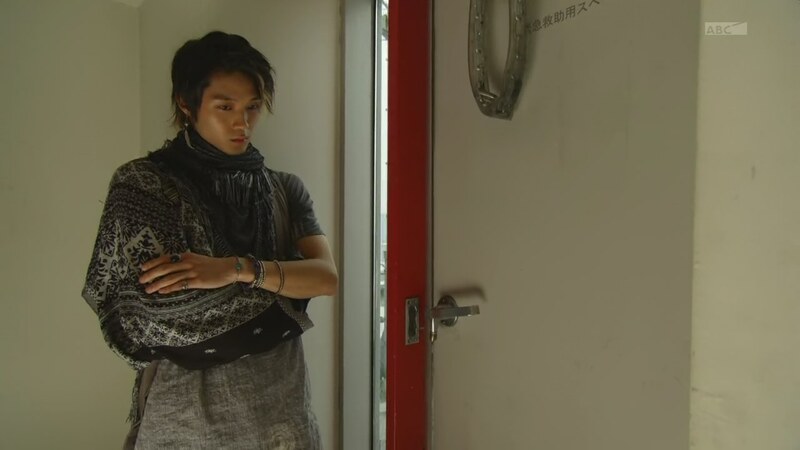 Takeru sneaks back into the office to listen to their conversation. Sakuma reports that another company has agreed to a takeover. Hashiba is determined to rule Japan and Sakuma encourages him. Meanwhile, Onari and Akari go around to other offices that have experienced strange phenomena. Akari notices a map with dots forming a familiar shape. It’s an eye! 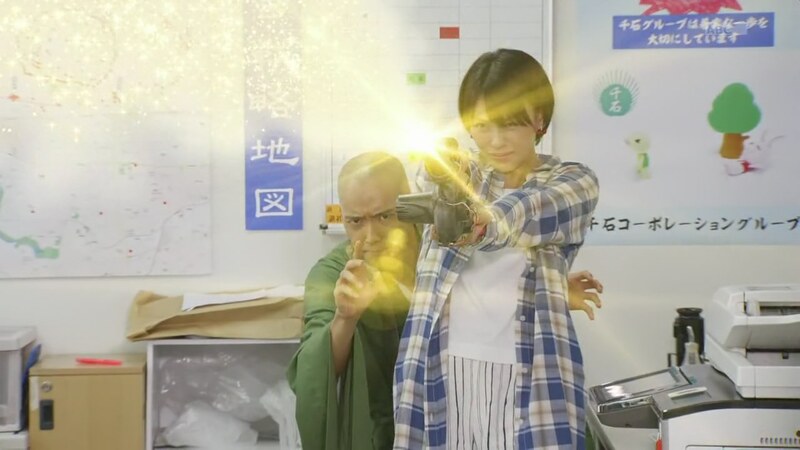 But the Ganma suddenly appears and Akari fires her revealing cannon to make the Ganma visible. The Ganma has actually split itself again and is at every one of the companies marked on the map forming the eye. The locations connect and a large eye appears. The land, with all the city on top it, rises out of the ground and into the sky. 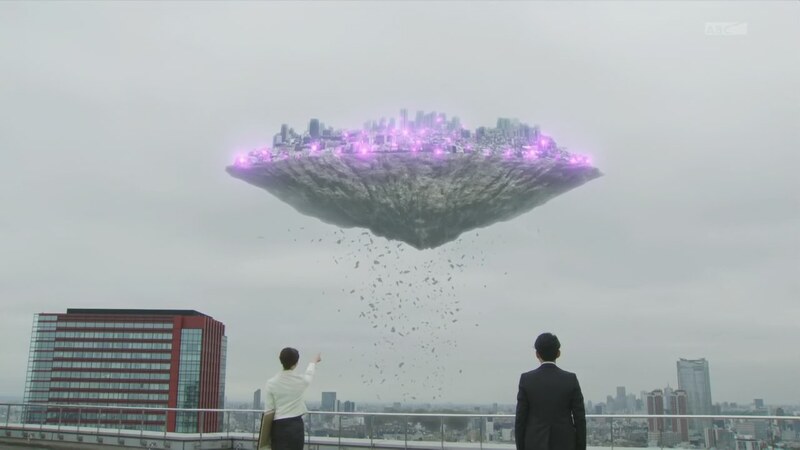 On the roof, Sakuma tells Hashiba that the floating island is now his city. From there, he will control Japan. Takeru and Kuroda get to the roof as well and try to talk to Hashiba. But Sakuma just feeds the fire that is Hashiba’s desire to become Nobunaga. Takeru tries to explain he is being controlled by a Ganma and that he will die. But Hashiba is fine with that if he can become Nobunaga. Takeru walks over, saying he will not give up. Takeru gives Hashiba a #TakeruHug and feels Hashiba’s will to live. The #TakeruHug snaps Hashiba out of his Ganma-induced stupor and the framed letter from Nobunaga stops glowing. Takeru tells Hashiba that Nobunaga was a feared warrior, but he cared for his retainers regardless of status, as is stated in the letter. Sakuma will not have any of this. The Ganma appears and Takeru henshins to Robin Hood. Kuroda runs over to Hashiba who realizes Nobunaga’s true qualities. He begins to glow brightly instead of the Ganma purple, as does the framed letter. Takeru and the Ganma are in the park. The Ganma splits himself up again, but Takeru uses Robin Hood Omega Drive Omega Strike to take of it. That causes the flying island to come crashing down back onto Earth. Takeru feels he has to do something about it, but Yurusen says he should hurry and go get the Nobunaga Eyecon. Takeru instead runs over to the island. On another rooftop, Aran waves his finger and sends Eyecons flying into the air. 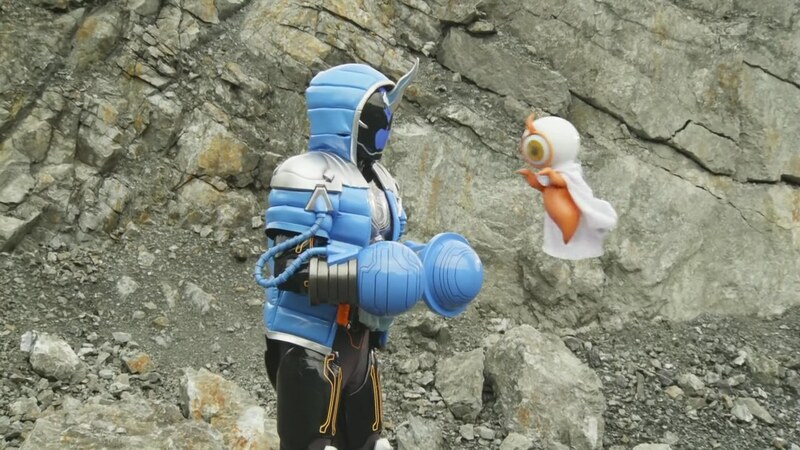 Takeru calls Yurusen who hands him the Newton Eyecon he obtained in the special Kamen Rider Drive epilogue. 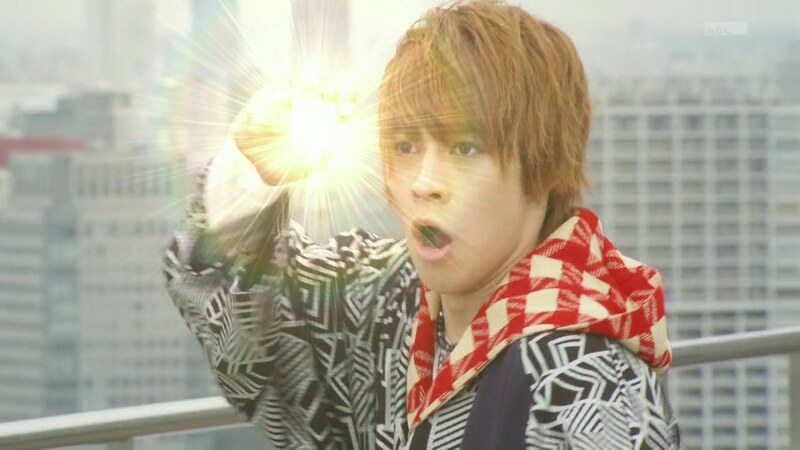 Takeru uses it and is able to help the city island land safely back in place. But he’ll get crushed? Nope, he’s already dead anyway, Yurusen reminds him. 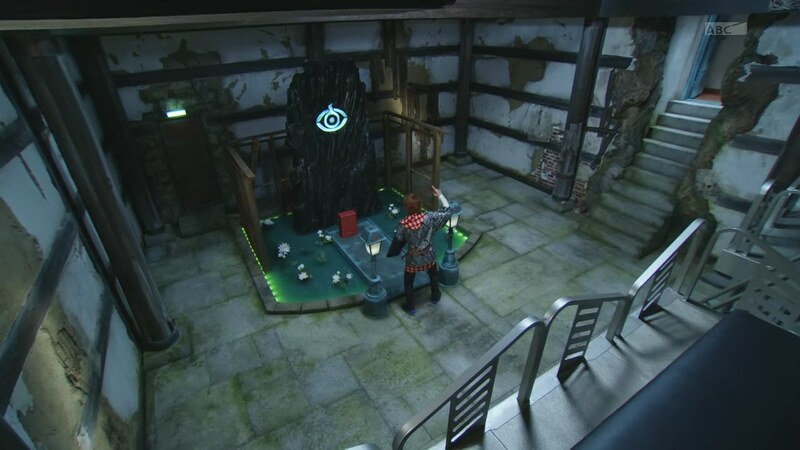 Takeru heads back above ground and Yurusen reminds him to hurry and obtain the new Eyecon. Sakuma has Hashiba by the neck, but Takeru stops her. He shoves her aside and draws an eye to release the Nobunaga Eyecon. Turns out Sakuma was controlled by a Ganma who now exits her body. Takeru quickly takes care of it. Aran has been watching from the stairwell. “Specter” he calls him. Back at the lab, Takeru tries to get answers out of Grampa Sennin who has none. Except to explain that a luminary’s ghost will only be brought forth by that person’s feelings. If a Ganma takes over that person’s body, then it’s a different person, thus impossible. Ghost is chugging along quite nicely. We get a little more explanation on how to bring the ghosts about and Ganma possession/influence. But I hope we get more from Aran and The Mysterious Man soon. Being creepers can only be intriguing for so long. What hasn’t been explained though is the #TakeruHug. I don’t know if I missed something, but I guess it’s just a very helpful thing that happens. It’s kinda random and maybe awkward, but it’s cool I guess. Hugging the Ganma influence away. I like Onari and Akari off doing their own thing and being serious about it. Takeru being dead also opens up a whole range of creative possibilities as seen in this episode with having a floating island fall on him. I do hope the cases of the week are less conveniently tied in with the Eyecons in the next episodes. Grampa Sennin gives a clue and Onari gets the case. That’s an okay formula for a couple of episodes to set this thing up, but I’d like to see them switch it up a bit. Overall though, very enjoyable. No worries. Good start continues. 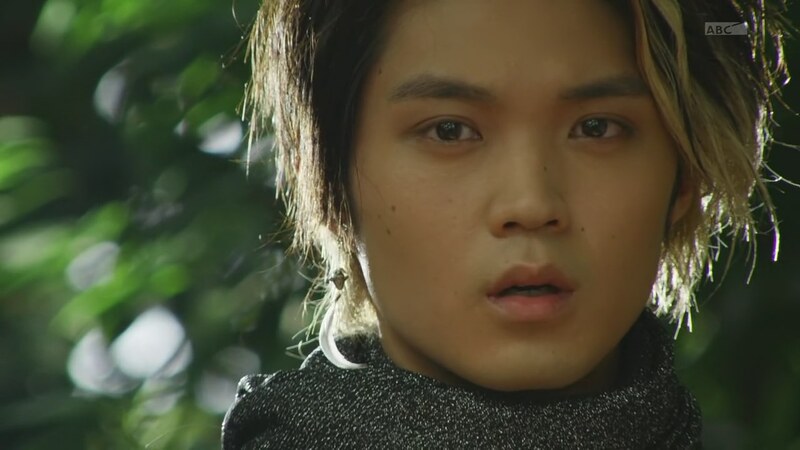 ← Recap: Shuriken Sentai Ninninger, Episode 35 – Kinji Enters the Youkai Labyrinth! 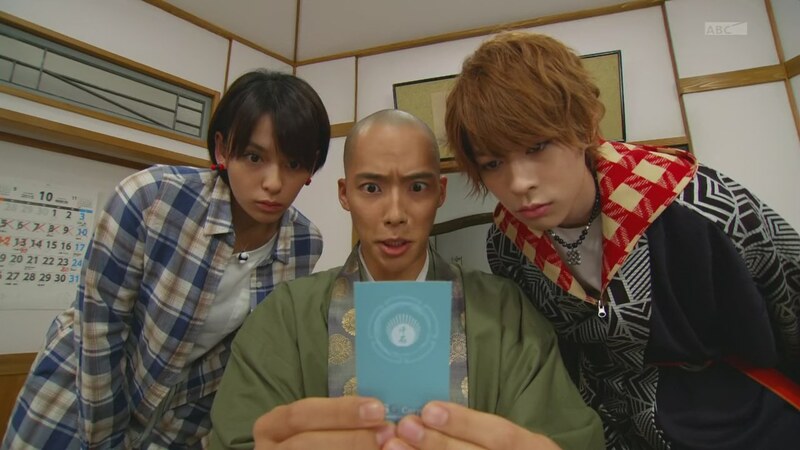 Im guessing that the “eyecon of the week” format is just for the first half or so before they switch to a more arc-focused narrative later on. There are a lot of hints here and there that there is something bigger in play. For one, the Sage somewhat intentionally misleading Takeru by not telling him that there are other Riders out to collect eyecons really reeks of DJ Sagara. Am guessing that Aran/Alan is himself a Rider. Note that, even this early, there are already three confirmed Riders for the series: Ghost, Spectre, and the yet to be revealed Necrom (probably Alan). So I won’t be surprised if they reveal more later on. 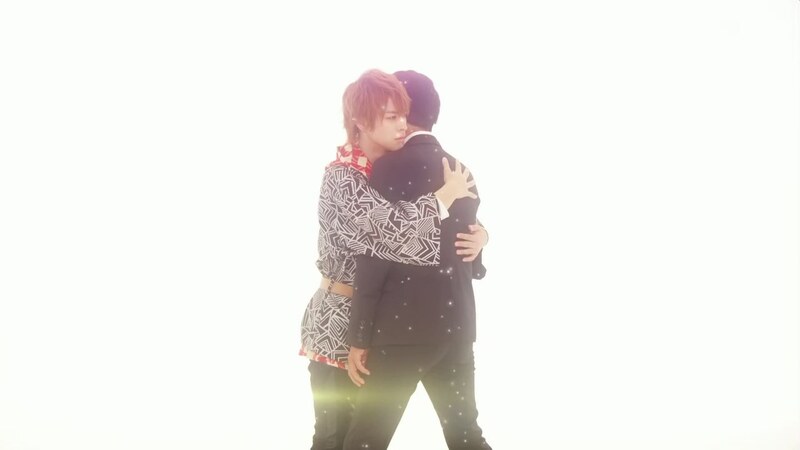 Also, the #TakeruHug is rather intriguing. as it gives Takeru this this sort of “guardian angel/saviour” air which I suspect would tie in later to the bigger theme of heroes’luminaries. Definitely something I want to see how they do it. Yes, I think so too, re: how the season will play out.